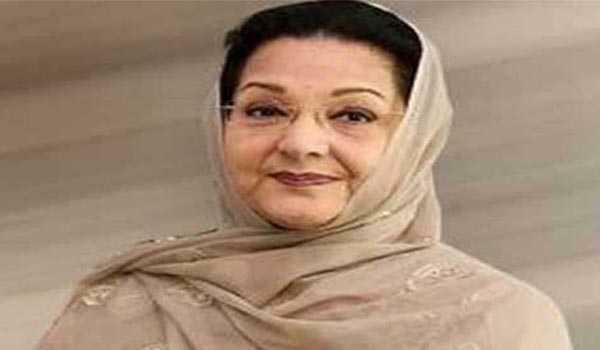 Islamabad, Sep 14: The body of Kulsoom Nawaz, Pakistan's former First lady, reached Allama Iqbal International Airport in the wee hours on Friday and funeral prayers will be offered at 1700 hrs. The funeral prayer will be offered at Sharif Medical City at Jati Umra in Lahore, a report in Radio Pakistan quoted PML-N spokesperson Marriyum Aurangzeb as saying. Her funeral prayer was also offered at Regents Plaza Park in London on Thursday. Former Prime Minister Nawaz Sharif's brother Shahbaz Sharif had also reached London to bring back the body of Kulsoom for burial in Pakistan. A special security plan is in place ahead of Kulsoom's funeral to avert any untoward incident. On Wednesday, Nawaz Sharif and his daughter Maryam were freed for five days on parole to attend Kulsoom's funeral. Kulsoom, 68, breathed her last on Tuesday at London’s Harley Street Clinic after months of battle with cancer.